Sure, Wyoming is still Cowboy country, and yes, it’s still necessary to clarify if you mean horses or bikes when you invite a friend out for a ride. However, rugged and beautiful Wind River Country isn’t necessarily any better suited for four hooves than two wheels. The opportunities for pedaling cowboys and cowgirls stretch as far as your enthusiasm and endurance will carry you. 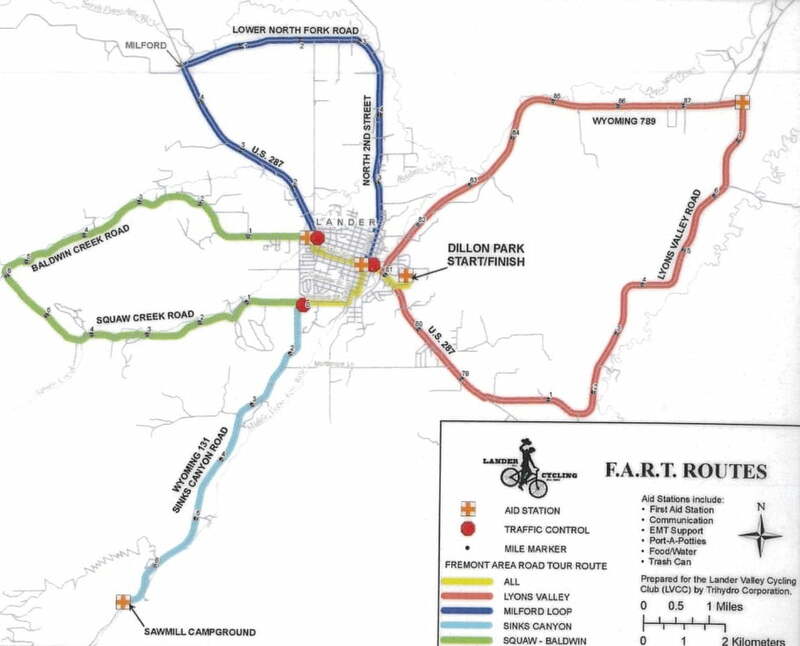 The Lander Cycling Club (LCC) has created this convenient map for routes starting from town, all of which are part of the annual Fremont Area Road Tour hosted by the LCC. Lander is a lucky place to start developing your lung capacity and Instagram photo feed. Even the map of popular road cycling routes looks like a three-leaf clover. Lyon’s Valley, Squaw/Baldwin, North Second, and Sinks Canyon are easy to access, and all under 25 miles. 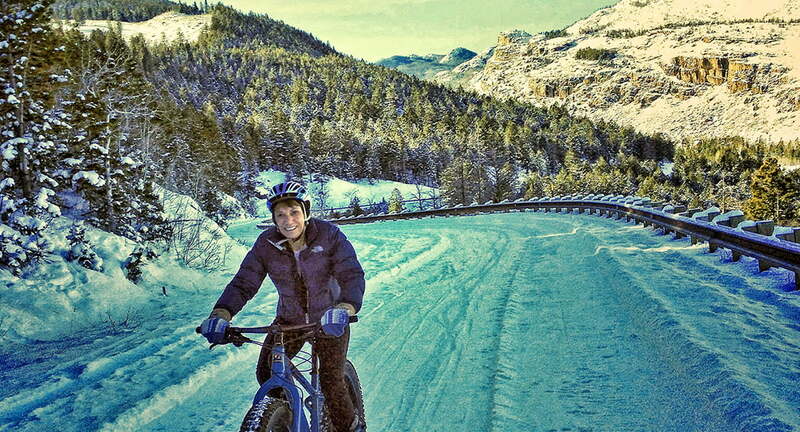 Rides starting from town in Dubois also offer beautiful badland and mountain landscapes. Roll out of town southeast on Highway 287 for an out-and-back of the any length that boasts red and white rock formations and the chance to spot a bighorn sheep. Point your helmet northwest on the same highway to explore the gorgeous Togwotee Pass as a stunning and challenging ride. Be warned: Dubois winds are strong; chances are if you don’t feel a headwind, it’s a tailwind! Between Dubois and Lander lies a vast landscape that is sometimes overlooked. 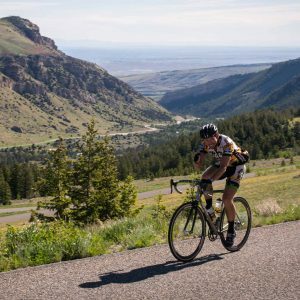 “I can’t stress enough how awesome the riding is on the [Wind River Indian] Reservation,” said longtime Lander cyclist Chris Brauneis. He recommends exploring Plunkett/17 Mile Road (on the right seven miles north of Lander on Hwy 287), Rendezvous Road (on the left one mile east of Hudson off Hwy 789), and riding to Kinnear or Ethete on the Blue Sky Highway. Trout Creek Road west from Fort Washakie will point you straight toward the Wind River Mountains for incredible views of the range for six or seven miles before you hit dirt. Fellow cyclist Steve Smith particularly favors a century ride through much of this country: take Hwy 287 north out of Lander and through Fort Washakie to its junction with Hwy 26, turn right, then follow that to another right on Hwy 132 until it meets back up with 287, which will take you home. 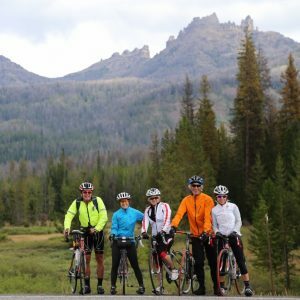 A better-known Wind River century route takes cyclists to Beaver Rim. If you’re starting in Lander, head south on Hwy 287, and stay on it when it turns left toward Rawlins. Follow 287 to Sweetwater Station, and take in the stunning views of the Wild West landscape before turning north (left) on Hwy 135. You’ll take another left for a short stretch of Hwy 789 before taking a right onto Hwy 138. This will lead you to Hudson, and from there you can make your way home to Lander and a well-earned local brew at the Lander Bar or Cowfish. If you prefer a shorter, more intense option, Sinks Canyon offers a steep climb up the switchbacks to the end of the pavement. The LCC map above illustrates the first half of this route; simply continue up the Sinks Canyon Road until your wheel touches gravel. It’s about 17 miles, 3,500 feet of elevation gain, and the best way to earn that view of the Winds at Frye Lake. Another climb that affords breathtaking views is the Red Canyon. Follow Hwy 28 south out of Lander and climb until you are ready to head back, but not before taking a moment to ogle Red Canyon from above. 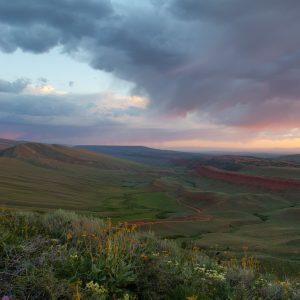 If you continue past the Red Canyon Overlook, points of interest include Limestone Mountain Road, Louis Lake Road, and even Farson—74 miles away—for some ice cream (but no lodging). Highway 28 south of Lander also provides access to a number of dirt roads, so if you’re in search of a mixed ride, that’s the way to go. Twenty-four miles from town, turn right off Hwy 28 onto Limestone Mountain Road for a long stretch of big climbs and exciting descents that eventually meet up with the Sinks Canyon Road at the top of the switchbacks (about 12 miles from town). Peddle a bit farther uphill on the paved highway to the Louis Lake Parking Lot and from there follow the Loop Road all the way past Louis Lake, Worthen Meadows, and down Sinks Canyon for about 70 miles of mixed terrain, lake views, and mountain vistas. If you’d like to get to dirt faster, cruise just nine miles south of Lander on Hwy 28 to the Red Canyon Road and follow that up as far as you like, through the Nature Conservancy’s ranch, or until it meets up with 28 again. Turn around or link up with any of the above roads for a longer adventure. “In general, I’d say the volume of dirt roads in the county provides an excellent opportunity for exploring the area around and in the Winds,” former Lander resident Phil Schneider reminisced. “There are heaps of forest roads that have a backcountry feel in the big mountains. Love it,” he concluded, encouraging visitors and locals alike to get out and see what they can find. If you prefer off-pavement pursuits of more technical or single-track nature, the true mountain biking trail options of Wind River Country will not disappoint and are rapidly expanding. For example, Dubois boasts the new Overlook Trail. This trail starts at the top of the Town of Dubois Recreation Area Scenic Overlook at the end of McKinley Drive and covers 639 feet of downhill and 315 feet of climbing in 3.2 miles. 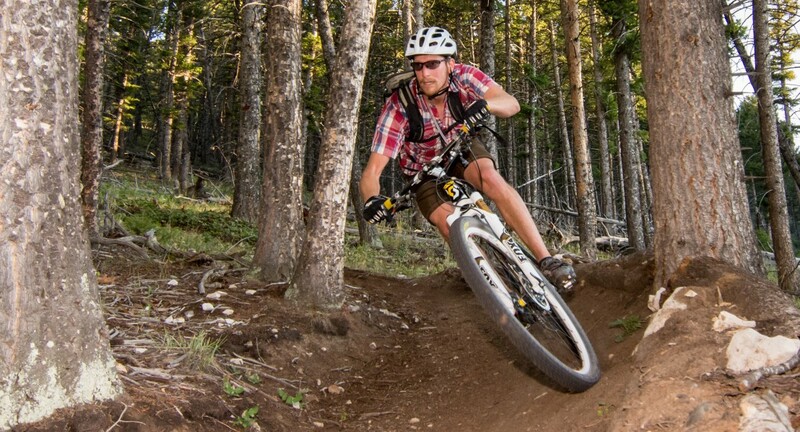 Learn more about the mountain biking scene in Dubois here. 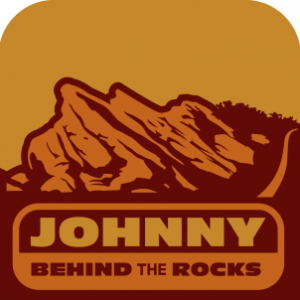 Outside of Lander, Johnny Behind the Rocks (JBR) and Sinks Canyon battle it out for top mountain biking destinations among the locals. 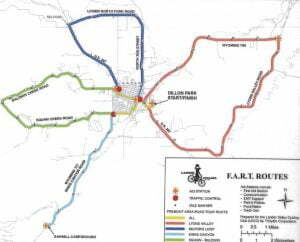 JBR is a network of trails, many of which were designed or improved by the LCC. Leave Lander going south on Hwy 287 and turn left at the junction to Rawlins, continuing east on Hwy 287. Shortly after crossing Twin Creek and passing a red cliff band on the left, prepare to turn left. The parking area, which lies about 15 miles from Lander, is clearly marked. Each year, the LCC hosts the Jurassic Classic race on JBR trails. Find a full map of JBR here. No list of adventures in Wind River Country should omit Sinks Canyon, which is rich in trails. For a prime example, pedal up Brewer’s Trail (from the Sinks Canyon Campground) to Fossil Hill, then out to Worthen Meadows parking lot and down Sheep’s Bridge—which joins up with the Middle Fork Trail—is a “top notch challenging mountain route,” Schneider recommends. 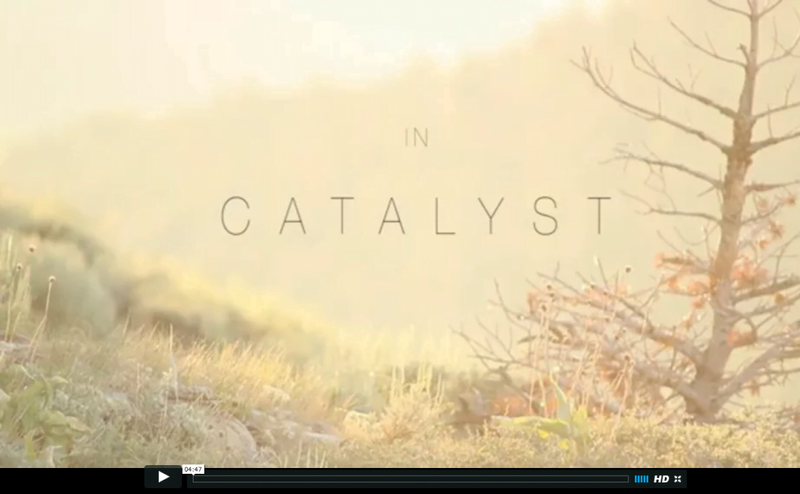 Watch a film taken on the Catalyst Trail here. Wind River Country is thick with fat biking potential, and many local and visiting two-wheel adventurers are eagerly exploring that potential. Learn more about the extensive opportunities for fat bikers here.